Alpro Strawberry/Banana and Peach/Pear are refreshingly sweet yogurts with no bits. Alpro is a tasty choice if you love yogurts, made with no animal fats, just tasty plant goodness with calcium, vitamin D and yogurt cultures. Eat well- feel uplifted. No bits. Full of soya and plant goodness. Deliciously nutritious and a source of plant protein. Naturally low in saturated fat. Source of calcium and vitamin D for strong bones and teeth. Source of vitamins: B2, B12, D2. Free from artificial sweeteners, colours, preservatives and animal fat. Naturally lactose free. 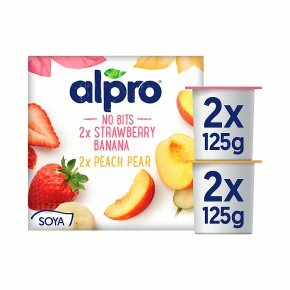 Suitable for vegans.Alpro®Strawberry & Banana/Peach & Pear are deliciously smooth fruity blends of soya and yogurt cultures with carefully selected fruit. Enjoy these alternatives to yogurt that are full of plant goodness. Eat well, fell uplifted.